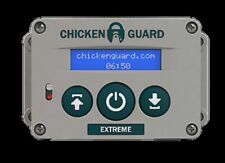 Chickenguard Automatic Chicken Coop Door Opener ASTx Extreme - Timer Sensor USA! 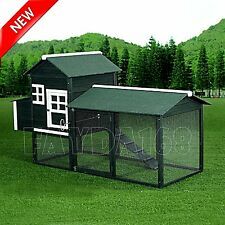 Large Walk in Chicken Coop Backyard Hen House Outdoor Farm Ranch Poultry Cage w/ Cover. - 1 x Chicken Coop. • Not Just for Chicken - Suitable for any of which can accommodate animals ranging from chicken to ducks and rabbits to cats, it’s a large outdoor walk-in farm poultry cage. And the light works to light up your coop on-demand if you need light while you are out there at night. Heat and cold are no problem. But water is a no-no. And the light works to light up your coop on-demand if you need light while you are out there at night. Heat and cold are no problem. But water is a no-no. Chicken Coop Light. 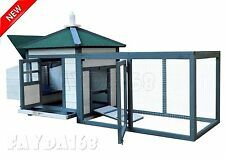 PERFECT OUTDOOR ADDITION: Elegant cottage design wooden chicken coop with safe waterproof paint suits for your raising, chickens, ducks and any other small poultry, a perfect addition to your outdoor area.|LARGE LIVING SPACE: A raised main house with a wire-fenced outdoor run, gives your chicken lots of room to rest and be active, also prevent them from escaping or being invaded by other animals. A 2-part nesting box is included and can be easily opened to extract eggs.|CONVENIENT: Multiple doors for easy access and cleaning. Ramp/Door allows chicken to enter the raised housing area easily.|WOODEN CONSTRUCTION& WEATHERPROOF: Crafted from solid fir wood and steel wire for superior strength and durability. Sealed with non-toxic, environmentally friendly paint for increased safety. Top roof c.
New chicken coop. Will house 8 - 10 chickens. Built strong. Dimensions: 60" wide x 38" deep x 48" high in front. Stands on 10" legs. Has a 14" nest box. Dimensions are overall. Has 2 roosting bars inside. Also has a sliding security door with a ramp attached. 3 nest boxes. Has a rubber roof. Delivery is available to local areas only. Please contact to see if we deliver to your area & for delivery fee. 12" X 12.50" X 12.5" Fully assembled. Durable plywood construction. Nice and comfortable for your hens. Makes for ez access for eggs or brooding. Easy to install with either a stapler or sandwich in between thin pieces of wood. Chickens have no trouble learning to go thru it with ease. Wire pen for Baby Chicks. Folds together for easy storage. Assembles quickly to corral chicks. Heat and cold are no problem. But water is a no-no. However, they are NOT interchangeable. The internal electronics are different. LayLight Programmable Coop Light. 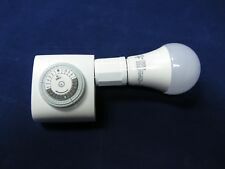 The LayLight is a high efficiency LED light for your chicken coop. Can be installed to open in any direction. Coop exterior sizes. Internal perches / aka: Rooster Bar(Not included). Suitable for Ducks / Guinea Pig / Rabbit Hutches. This house is made from 12mm tongue and groove treated fir timber. Run size (65"W x 24"D). An integrated LCD screen ensures it is easy to set up and alter timings when necessary. You won’t need an 8 year old to program this door! And we have even designed extra big buttons so you can program the unit with your gloves on in the winter – we really do understand all about bad weather. 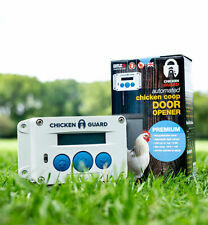 Chickenguard Automatic Chicken Coop Door Opener AS Standard (Opener only). Running on only 4 x AA batteries (or external power with the built-in USB port), our AS Standard door opener has been designed with ease of use in mind. This high quality Large Deluxe Chicken coop is made from fully treated and grooved fir wood. Can also be used as a Rabbit Cage/ Run, Guinea Pig Cage/Run, Chicken, Quail, Fowl or Poultry House. Chicken coop. The hutch includes a pull-out tray for easy cleaning and maintenance. An access door allows rabbits to go down the ramp into the outdoor space which is enclosed with rabbit-friendly wire. Advantek The Stilt House Rabbit Hutch. Easily portable that allows you to move the coop throughout your landscape. Large sliding access door to the run with remote handle. Removable Divider to make the Nest Box into 2 nest areas. Hinged Nest Box Lid to Collect the Eggs. A water-based paint gives a green finish to a chicken coop that has an expansive living area for your chickens and a dual-sectioned nesting box. Indoor nesting area with a large outdoor run that your birds will love. Large sliding access door to the run with remote handle. Removable Divider to make the Nest Box into 2 nest areas. Hinged Nest Box Lid to Collect the Eggs. This chicken coop is constructed by high quality solid Fir wood. Two perches inside. Large side located Nesting Box. The Plantation Easily portable that allows you to move the coop throughout your landscape. 200 75 121. Asphalt roof against weather conditions. High strength screwed construction. Nest area partitioned from the living area. 365x174(109)x169. Solid heat-treated fir wood construction. Locking entrance doors to living area and nest area. Run area can be accessed through hinged door with locking assembly. Easy to set up and use. 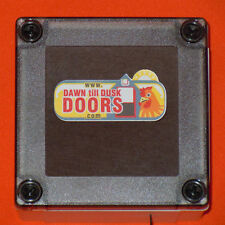 Includes durable plastic panels which are washable and reusable. Panels are attached to each other, simply unfold to set up. Zip ties are included to complete the assembly and will hold up the adjustable brooder lamp hanger (lamp not included). The Habitat Chicken Coop has a unique look and has been designed to provide your chickens protection from predators and weather conditions. The long slanted roof provides the perfect cover to protect your chickens from weather conditions and the spacious coop is perfect for those looking for a combined chicken house and run. The Tower Poultry Hutch is sure to look great in your backyard or barnyard. Constructed of lightweight, rot-resistant and insect-resistant fir lumber, this roomy tower-style chicken hutch will last for years. A water-based paint gives a green finish to a chicken coop that has an expansive living area for your chickens and a dual-sectioned nesting box. 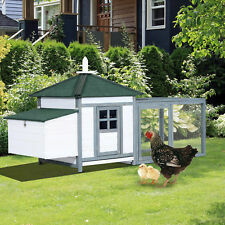 Pawhut Wooden Backyard Poultry Hen House Chicken Coop - Green. NEW Pawhut presents our deluxe model chicken coop, nesting box and backyard run in one. Rabbits, chickens, duck and other poultry love the safe and secure enclosure that is well built to suit their needs and yours.